I recently sailed to Sucia Island in the San Juan Islands of Washington State. A pretty place, it is well worth a visit and a stroll along its paths. And, because it was March, there were almost no other visitors — quite a contrast to summertime, when the anchorages are crowded with boats. After some hours watching a bald eagle soaring along a cliff, I hiked back to where I had dragged my dinghy onto the beach. As I prepared to launch, I spotted something peculiar offshore — something tilted, maybe a knocked-over reef marker. Then it came to me that instead of something small, close by, I might be looking at something bigger at a greater distance. I grabbed my binoculars, and sure enough, it was a reef marker — a 32-foot, eight ton warning to other boats — stay away from here! 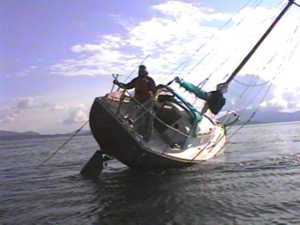 A Canadian sailboat had passed too close to an offshore reef and gone aground, and had become progressively more stuck for 2 1/2 hours as the tide fell. I had just bought a new inflatable dinghy and equipped it with a five horsepower outboard — I decided I could at least transport the skipper to the island before nightfall. I motored out to the reef and offered assistance (and took the picture above). If the line was too short, I and my dinghy would be plucked out of the water when the boat righted itself. With a long line, the dinghy would be making a nearly horizontal pull — the most efficient arrangement. A long line would allow me to develop some speed before the line became taut. And what was I thinking? I realized I could rotate the boat by pulling on the top of the mast, just as the wind does in normal sailing. The top of the mast is the point of greatest leverage on a sailboat, and a relatively small force applied there can rotate the entire boat. This idea would work if the keel was the only part of the boat touching the rocks. I would use the dinghy to pull the mast, the boat would rotate further, the keel would come off the rock, and the substantial current (see the current in the above picture, right lower center) would draw the boat away from the reef. If, on the other hand, I broke the line, the broken end would wrap around my outboard prop and I would drift away in that same current, into a large area of open water — but I tried not to think about that. The skipper attached some additional line to his main halyard and passed it to me, then I added my own 38 foot line, for a total of about 100 feet. I made some relatively slow runs, to little effect, then I gradually increased the speed and allowed the line to grow taut abruptly, to take advantage of the dinghy's momentum. At first I could only turn the boat horizontally against the rock — I wasn't rotating it off the rock very much. Then I increased the throttle setting and the run length, coming up to the boat and then racing away, paying out the line to keep it out of my prop, and letting the line become taut quickly. After about eight fast runs, the boat began to move — then it came off the rock all at once with a great racket as the keel bounced on the reef. Then, as I expected, the boat became vertical and I was dragged rather quickly toward it — but the long line kept me in the water. Success! This method is much like that recommended in sailing textbooks — attach an anchor to a long line that is, in turn, attached to your halyard, position the anchor far from the boat, then winch the halyard to rotate the boat off the reef. But this skipper had no dinghy to set up the anchor, also, because of the strong current he probably would have lost control of the situation after coming off the reef. By contrast, with a powered dinghy I could release him almost immediately after the boat became free. It was a satisfying rescue, and fairly effortless, at least compared to some of the "anchor stories" told in my book "Confessions of a Long-Distance Sailor."